Lise Quintana is a writer, techie and entrepreneur. She’s currently developing an app that will support ebooks with multiple viewpoints “in big, epic ways”. I’ll say more about her app in a future post. For now, I’m intrigued by what Quintana thinks about the future of publishing. That got me thinking about reasons for paper books. Which books will still beg to be published on paper, when ebooks are more and more accepted? 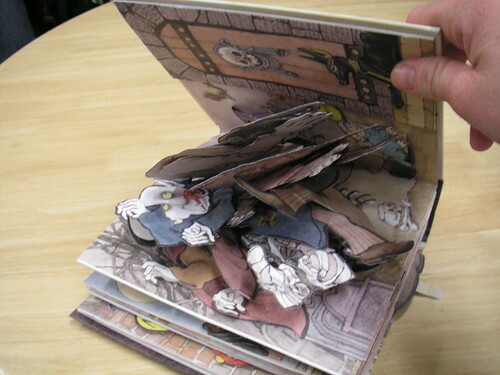 Some book lovers and industry watchers think that picture books will always be in paper format. The argument goes: who wants to curl up with a child on your lap – and a Kindle in one hand? Kind of destroys the whole experience. No more long, slow, suspenseful page turn. And if the book has audio, that competes with the parent/reader acting out the roles. But apparently, a growing number of others like the convenience of ebooks, as sales for children’s ebooks show. Different market segments may insist on paper books. I’ve seen reports that teens still want very much to own physical books, and it will be interesting to see if that continues to hold true. Book clubs may insist on paper copies. The book club experience is about hanging out with friends and food, and tablets don’t necessarily add to that ambiance. I’m guessing there will be market segments of non-adopters. Readers who just never get on board with ebooks and tablets, because of age, or access to technology, or other reasons. What types of books do you think beg to be printed on paper?